A true monster of the catfish world, the Red Tailed Catfish is the largest of the catfish available in the hobby. Many people believe that offering this fish for sale in pet shops should be banned, due its enormous size once full grown and its predatory nature. This is something that I have to agree with, despite my own passion to one day own one of these beauties. With a dark, speckled upper body, white throat and dark fins, and its trademark red tail, these catfish are dramatic enough to appeal to almost anyone. Sadly, very few people realise the size that a Red Tail will achieve and the effort required in providing one of these monsters with adequate housing and feeding for the duration of its life. Local aquariums often become dumping grounds for unwanted Red Tails, but their generosity can only stretch so far. I would ask anyone reading this profile and considering purchasing a Red Tailed Catfish to please be sure that you are ready and willing to house this fish in a suitable tank and provide it with proper care and feeding for the next 20 to 30 years, as that is the general lifespan of a Red Tailed Catfish. Juvenile Red Tails are often offered for sale as small as 1 to 2″, and at this size they can be housed in as little as a 20 gallon aquarium. However, this set-up will not last long, as these fish grow very fast given proper feeding. You will soon be needing to upgrade to progressively larger and larger aquariums, ending up with something along the lines of 1500 to 2000 gallons. As you pick your jaw up off the floor, start rubbing your eyes and checking that you read that last line correctly, yes, I did say 1500 to 2000 gallons. This is not a fish for the faint of heart. Their natural habitat is the river basins of the Amazon and Orinoco Rivers, where these rivers are at their deepest and widest. As your Red Tail grows, the amount of decoration in your tank should decrease to give them as much manoeuvrability as possible. These are big fish and they do not turn in a small space. A hiding space should be provided; usually this is accomplished by using large ceramic drainpipe. Red Tails spend a lot of time lurking in their hidey-hole with only their barbels showing. Large rocks and pieces of driftwood are the usual decorations in a Red Tail tank, with many people also adding large fake plants to simulate a river bottom. These need to be very, very well secured. With their sheer bulk, these fish can dislodge almost anything given the chance. Red Tailed Catfish diet in the wild consists of fish, large crustaceans and, surprisingly, fruit. Very small juveniles should be fed twice a day and it is a good idea not to let them get used to live food at an early age. This will prevent problems with refusing other types of food later in life. Bloodworms, earthworms and good quality pellets or tablets designed for carnivorous catfish are a good staple diet when they are young. As larger juveniles, Red Tailed Catfish can be fed once a day with similar types of food. As they grow, their diet can be altered to include small shrimp and crabs, with the occasional treat of shellfish and beef heart. As adults, feeding should be done once or twice a week, with a period of fasting in between meals. At adult size, most Red Tails will ignore foods such as bloodworms and pellets as they are simply not large enough to satisfy their predatory appetites. At this stage, large portions of shrimp, crabs and beef heart are the best source of protein for these monsters. Feeders can be used for adult fish, but they will need to be of a larger size that those offered to large, predatory cichlids. The mouth size of a Red Tailed Catfish cannot be overestimated. I can personally attest to the size of a Red Tail mouth, having seen a Red Tail at a pet shop not far from my home happily chow down on a 12″ goldfish. 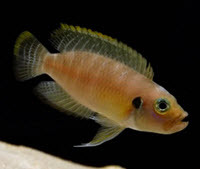 This makes these fish extremely poor tank mates for pretty much anything, and the happiest Red Tail tank will be one that it does not have to share. It has been said that keeping your Red Tail well fed will allow them to be kept with other large catfish and various other large fish, but in all honestly, this really should not be attempted. One picture that will always stay with me is one of a 3′ Red Tail happily munching on an 18″ clown knife fish. If you are determined to keep your Red Tailed Catfish with other fish, then nothing that I can say will change your mind, but be prepared for heartache and tragedy. Large cichlids will constitute a nice meal for your Red Tail and smaller cichlids are merely in between meal snacks. There have been no reported instances of Red Tailed Catfish breeding in an aquarium setting. This is mainly due to their dislike of each other, and the fact that a tank to house two Red Tails would need to be in the vicinity of 3500 to 4000 gallons. If you are getting the idea that I am trying to talk people out of purchasing a Red Tailed Catfish, then you are correct. There are some species of fish that, no matter how appealing, should not be kept in aquariums and the Red Tail is one of them. The people that I know who have adult specimens of this fish are all highly experienced fish-keepers with many years of experience with numerous fish behind them. They are all well aware of the requirements of a Red Tailed Catfish and have been willing to take on the massive task of providing for these monsters. If you are not prepared to follow their example, then please rethink your plans to buy a Red Tail and find something more suited to your experience, commitment level and budget.